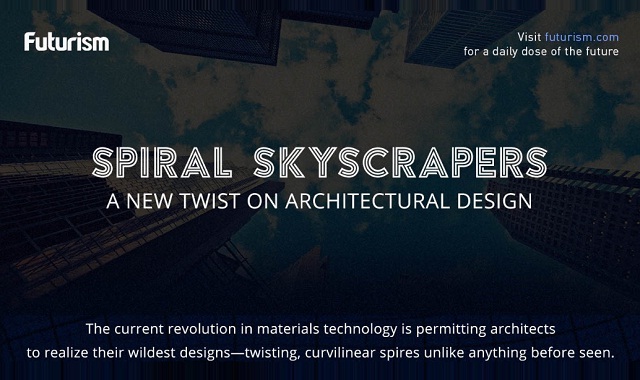 Spiral Skyscrapers A New Twist on Architectural Design #infographic ~ Visualistan '+g+"
Spiral Skyscrapers A New Twist on Architectural Design The current revolution in materials technology is permitting architects to realise their wildest design - twisting, curvilinear spires unlike anything before seen. The Council on Tall Buildings and Urban Habitat (CTBUH) reports that there are now 28 skyscrapers with twisted structures either built or under construction. Here's a look at some of these neo-futurist buildings that are changing the world's urban skyline.